Phonographic Copyright (p) – Trax Records Ltd. Copyright (c) – Trax Records Ltd.
© P 1988 Trax Records Ltd. Some copies have no B side label. This is a bit trivial, but my orig trax pressing has a red label (when I say red label, i don't mean the tidied up artworked one with a barcode). It's definitely an early press, and has all the low-quality hallmarks. Dodgy trax pressing/printing/artworking, just wondered if it might be 'special'? All the first edition trax copies i have seen have black labels. Any ideas? 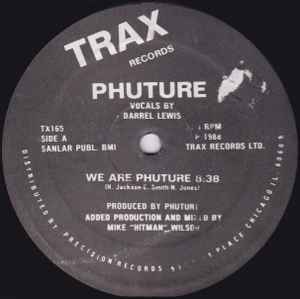 Recently, DJ Pierre gave me an interview which I had the chance to ask about a very special chapter of the history of Acid House music - 'We Are Phuture'. On that matter, he said: "We started this project because everyone else was doing Acid House, and we wanted the future. Something that will always be one step ahead, always growning, moving". Phuture was different from any other act from the Acid House era, indeed. "I wrote the lyrics, like most of the songs", said Pierre again - but they soon realized that the dark, scaring vocals on the beginning should be from Earl 'Spanky' Smith: "Survival's our mission... Traveling through time... You're growing old but we're changing... The right place, we try to find... In space we journey, through endless emissions... As meteor showers, bad weather conditions... The future will survive! The future will stay alive!" With rocket ships and laser guns, and acid music can you hear...", bringing a very unique atmosphere to the tune. These poetry references to spaceships & laser guns, added to very powerful beat lines by Spanky and amazing bass lines & acid lines by Pierre, make this a very essential masterpiece. The bassline drop, very intense, is a formidable moment of it, exactly when the dark vocals from Spanky say "Phuture, Phuture... Phuture Phuture, Phuture(...)" - sampled and included on several cut & paste megamixes and the like. The (Ph)uture and evolution were the main marks of this group leaded by Earl Smith, DJ Pierre and Herbert Jackson, as shows the quote "The future grows among you, Through the darkness of our time, You cannot turn us back, 'Cause progress is our sign". This was, by the way, the last time that this trio was behind Phuture. "I didn't even know that this music reached Europe before 1989", claimed Pierre on the same interview, "Or even which labels got the license or the rights to release it outside the U.S.", refering to the German release by ZYX, another huge hit in the other side of the Atlantic. These young kids from Chicago usually stayed apart from the labels negociations, such as this one between Larry Sherman (Trax) and ZYX staff. Amazing record, this was one of the first acid house tracks I ever heard and it stands up above a lot of the others still today, a real timeless classic this. Perhaps not DJ Pierre´s best work,but this Marshall Jefferson produced wonder spawned a generation of copyists who have since attempted to emulate that twisted bass rumble.Proclaimed the Roland 303 the machine of the century.